Wisconsin’s failure to provide access to the ballot for all of its eligible voters has real, anti-democratic consequences. Just ask Zack Moore. When Moore applied for a free voter identification card in Wisconsin, the 34-year-old African American was turned away because he did not have his birth certificate, even though he supplied his Social Security card, out-of-state photo ID, and pay stub as proof of residency. Sarada Hanumadass faced a similar situation when she tried to get her free voter ID. Even though she was a Wisconsin state employee and had a valid driver’s license, a Social Security card, proof of residency, and a marriage certificate, the Division of Motor Vehicles, or DMV, in Sun Prairie, Wisconsin, told Hanumadass that she would need a copy of her birth certificate to prove her citizenship. Because she was born in Ireland, she was told that she would need to show her naturalization papers, which would cost $345 and take up to two years to receive. Christine Krucki, who has been voting since 1948, was also blocked from getting a voter ID. The 90-year-old made three trips to Wisconsin’s DMV this year, bringing an Illinois photo ID, proof of residence in Wisconsin, a birth certificate, and her marriage certificate. Still, she could not obtain the free ID that she would need to cast a ballot under Wisconsin’s strict ID law. These three voters—and many more—had their right to vote taken away because of Wisconsin’s photo ID law. The state also failed them by not living up to its promises to prevent disenfranchisement. In August, a federal appeals court refused to reinstate a lower court’s order that would have dramatically altered a voter suppression law in Wisconsin and would have made it easier for Wisconsin voters to cast ballots. The court’s refusal was based solely on assurances from the state’s attorneys that Wisconsin had already taken—and would continue to take—adequate steps to get people the documents they would need to be able to vote. Specifically, state attorneys assured the court that the state had already enacted a rule requiring the DMV to mail a free photo ID to anyone who initiates the free ID process, without requiring them to produce a birth certificate. Voters were to receive their IDs in the mail within six days of applying to ensure that they arrived in time for November’s election. Without these documents, eligible Americans who are registered to vote will be blocked from casting their ballots and having their voices heard. Nine percent of Wisconsin’s registered voters—300,000 people—do not have one of the few acceptable forms of strict voter ID required to vote, according to the state’s own analysis. These citizens are relying on the state’s promise of free and readily accessible voter IDs to exercise their right to vote. Early voting has already begun in Milwaukee, Madison, and elsewhere in the state. On September 29, reporting from both VoteRiders and Ari Berman of The Nation revealed that Wisconsin failed to live up to its promises. In the words of ThinkProgress reporter Ian Millhiser, the state’s promise to protect voters from disenfranchisement “doesn’t amount to a hill of beans.” Wisconsin Attorney General Brad Schimel had previously told the court that the “DMV will now be issuing photo identification receipts no later than six business days from receipt of the petition application.” But only 3 of the 10 DMVs surveilled by VoteRiders told applicants that they would receive voter IDs within a week or less. On-the-ground investigations found that Wisconsin’s DMVs continued to require applicants to present hard-to-acquire documentation, such as birth certificates. During the October 12 hearing, Judge Peterson lambasted Wisconsin’s DMV for giving out inaccurate information to prospective voters. He expressed his frustration “that the state really did nothing” it had promised to provide voting credentials to anyone who applies. But in a follow-up hearing held on October 13, Judge Peterson refused to suspend the voter ID law, citing the proximity to the election. He did, however, order the state to implement several changes, or “improvements,” to the law. Some of the changes were immediate, while others will take place this week. Beginning October 14, the parties were ordered to submit a one-page information sheet, or “palm card,” that “clearly and succinctly” explains how the free ID process works, as well as a revised page for the DMV website that explains the process. The state was required to distribute these documents no later than Monday, October 17, to voting rights groups, municipal clerks, the media, and anyone else on DMV contact lists. Beginning this week, the state is also ordered to provide follow-up training and competency checks for its DMV workers and to dedicate additional resources to funding a public information campaign about the state’s voter ID law. This is to ensure that people are informed about the availability of IDs even if they do not have birth certificates or other hard-to-obtain documents. Additionally, the state will report to the court on its administration of the voter ID law every Friday from now until the election. Voting rights advocates have already voiced concerns that the order does not go far enough. While Judge Peterson informed attorneys that they can appeal today’s decision, it is unclear whether any court will hear the case this close to November. The Purcell v. Gonzalez principle generally dissuades courts from changing rules for elections close to election day, but that should be subordinate to the idea that the integrity of our elections rests on the ability of every eligible American to cast a ballot. Courts should not enable new barriers to voting close to election day when there is not sufficient time to prepare for smooth implementation. But courts should intervene in situations such as this, in which voters face an unnecessary, discriminatory burden and court-approved remedial efforts have not been carried out properly, leaving voters to suffer undue burdens on their right to vote. In these cases, it is perfectly appropriate—and necessary—for the courts to step in to remove unjustified barriers that make it harder for eligible voters to cast their ballots. Wisconsin’s government has already failed to abide by court orders in the past and seems largely oblivious to the problems associated with the state’s voter ID law. Wisconsin Gov. Scott Walker (R) has continued to maintain that the state’s voter ID law is working “just fine,” despite numerous reports of Wisconsin voters struggling to get the newly required ID. This shows a disquieting disregard for voting rights. At the same time, it undermines confidence that the state will do any better this time around in meeting their obligation to provide free IDs in a timely fashion to the hundreds of thousands of Wisconsin citizens who face this new requirement. In other ways, some state officials have been proactive in making sure that Wisconsinites have their voices heard in November. On Friday, the Wisconsin Elections Commission approved a new policy for processing and counting absentee ballots. 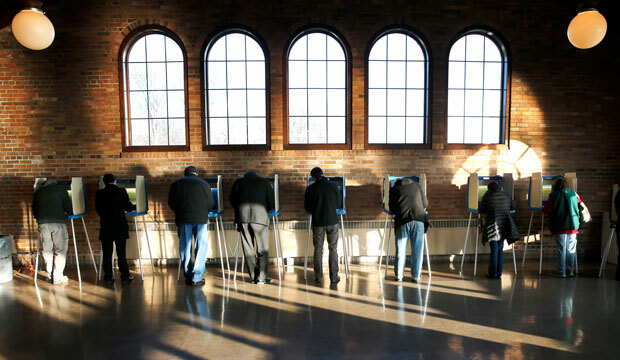 Controversy arose earlier this month when it was revealed that 400 completed absentee ballots in Milwaukee and 200 in Racine were not being counted simply because of an incomplete witness address. Voters were not informed of the need to provide their witness’s municipality, nor were they told that omitting it would result in the rejection of their ballot. The commission’s new rule requires clerks to take over responsibility for finding a witness’s missing municipality after a ballot has been submitted, using available resources. Clerks are then tasked with filling in the missing information on the voter’s ballot certificate. This new rule will help to ensure that ballots are not thrown out because of bureaucratic red tape. With early and absentee voting having started already in Wisconsin, it is the duty of Wisconsin officials to remedy its abridgement of voters’ rights by following through on the state’s promises and Judge Peterson’s orders to provide voter IDs immediately and without delay. Otherwise, higher courts should step in to order fundamental changes to the ID requirements that allow Wisconsin voters to cast their votes upon signing an affidavit affirming their identity. The integrity of our elections demands that every eligible American can cast a ballot that is counted. Liz Kennedy is the Director of Government and Democratic Reform at the Center for American Progress. Danielle Root is the Voting Rights Manager at the Center.